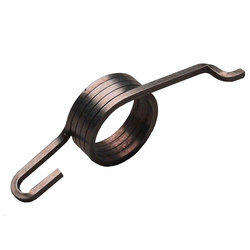 Our product range includes a wide range of copper torsion spring, double torsion spring, spiral torsion spring and torsion springs. 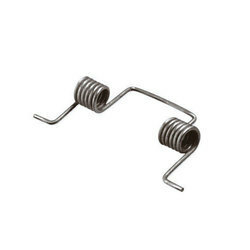 Our clients can avail from us a high-grade Copper Torsion Spring. These quality-approved springs are manufactured using the high-grade raw material, obtained from the most trusted vendor of the industry. We employ machines and equipment as per the latest technology trend to deliver a high-quality product to our clients. These springs are wound left or right hand so that the deflection causes the spring to wind up from the free position- never to unwind from that position. As the torsion springs wind up they reduce in diameter and their length becomes longer. Our organization is widely recognized as one of the most authentic manufacturers and suppliers of high-quality Double Torsion Spring. These products are manufactured by making use of high-quality raw material, obtained from the genuine and trusted vendor in the industry. We are the prominent business entity engaged in manufacturing and supplying high-grade Spiral Torsion Springs to our respected patrons. These types of springs should be supported over a rod when possible. To eliminate coil friction a slight open space should be provided between the coils. This would alter the deflection and torque. 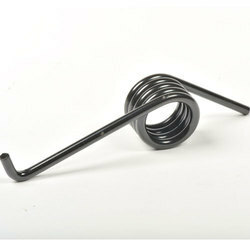 Our clients can avail from us a high-grade Torsion Spring. These quality-approved springs are manufactured using high-grade raw material, obtained from the most trusted vendor of the industry. We employ machines and equipment as per the latest technology trend to deliver a high-quality product to our clients. These Torsion springs are wound left or right hand so that the deflection causes the spring to wind up from the free position- never to unwind from that position. 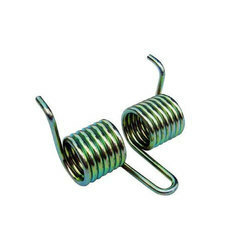 As the Torsion springs wind up they reduce in diameter and their length becomes longer.